Easily connects two HDMI cables to work over a greater distance. Easily connect two HDMI cables to work over greater distances. 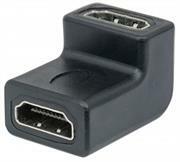 HDMI female to female insert coupler. Used for a wall panel to pass HDMI video signal from one side to the other neatly. 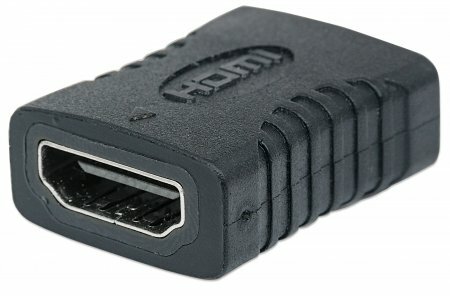 • This HDMI female/female coupler for connecting the two male ends of two HDMI cables to make a longer cable. • This is a general audio/video adapter that converts a current type of cable end into a connector that is different in connection format. 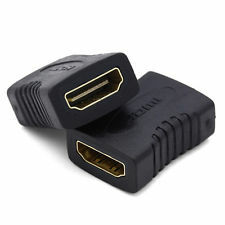 • Use this unit if you are trying to extend an HDMI cable or if you are trying to connect 2 HDMI cables, both of which have male ends. This is a PASSIVE device meaning there is no additional power needed.